The New Mexico Application For Certificate of Authority For Profit Corporation | Form FPR is expected to be filed by the New Mexico Corporations and Businesses Bureau of the New Mexico Secretary of State Department before transacting business in this State. 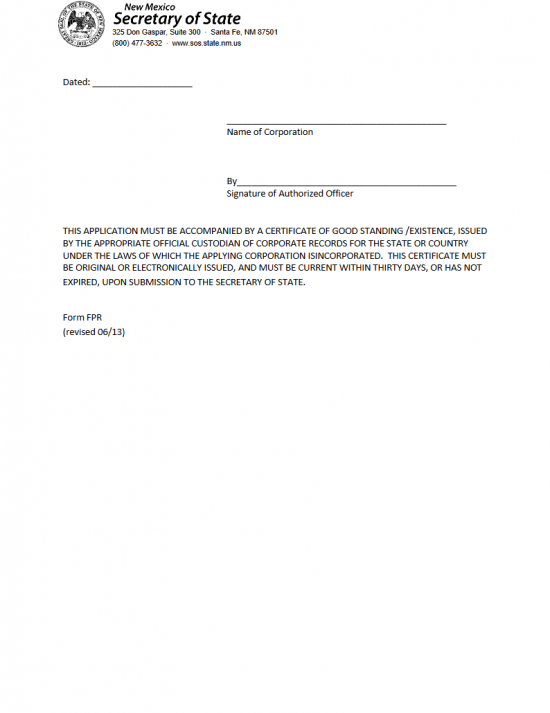 This document must be submitted with a minimum of three other documents: A Certificate of Good Standing issued by the foreign corporation’s domicile state within thirty days of the application date, the Document Delivery Instruction form which shall deliver the necessary contact information the New Mexico Corporations and Businesses Bureau requires for both communication and the delivery of the Certificate of Authority, and the completed and signed New Mexico Statement of Acceptance of Appointment By Designated Initial Registered Agent. It should be noted the New Mexico Application For Certificate of Authority For Profit Corporation | Form FPR must be submitted in duplicate. That is, there must be the completed original and one copy and both must be signed. Step 1 - Download the New Mexico Application For Certificate of Authority For Profit Corporation by selecting the “Download Form” link above then download the Document Delivery Instruction Form by selecting the “Download Document Delivery Instructions” link above. Step 2 - In Item 1, enter or write out (in black ink), the Full Name of the foreign entity precisely as it is written on the Certificate of Good Standing obtained from the proper governing body in its home state on the blank lines provided. Step 4 - Item 2 should be filled out only if the True Name of this corporation does not comply with New Mexico law, you may operate under a Fictitious Name. If this is the case, then a resolution statement from the Board of Directors stating the Fictitious Name the foreign corporation must operate under. This must be signed by an authorized Officer. This resolution must cite the New Mexico Agency that has denied the foreign entity’s ability to use and operate under its True Name. Step 5 - In Item 3, enter the Date the foreign corporation incorporated in its domicile state on the first blank space. Then, on the second blank space, report if there is a period of duration. If there is, enter the pre-determined Termination Date of this corporation, the amount of time until it dissolves, or the word “Perpetual” (to indicate if the foreign corporation intends on operating indefinitely. Step 6 - Next, in Item 4, report the Full Address of the foreign corporation’s Registered Agent in its domicile state on the first blank space. Then on the second blank space, report the Full Address of the corporation’s Principal Office (if different from the Registered Office). It should be noted that both of these office addresses should be where they are physically located. Therefore, a P.O. Box will not be acceptable here. Step 7 - In Item 5, report the Street Address of the Physical Location for the initial Registered Office in the State of New Mexico this corporation has obtained on the first blank line. Then, on the second blank line, report the Full Name of the Registered Agent who shall receive court documents on behalf of the foreign corporation. Step 8 - In Item 6, document the Purpose behind this corporation’s intent to transact business in New Mexico. You may continue this on a separate sheet of paper if there is not enough room. Step 9 - Item 7 will require a full listing of the Officers and Directors in the foreign corporation on the spaces provided. This should be a complete listing of these individual’s Full Names, Titles held, and Addresses. This may be continued on a separate sheet of paper if there is not enough room. 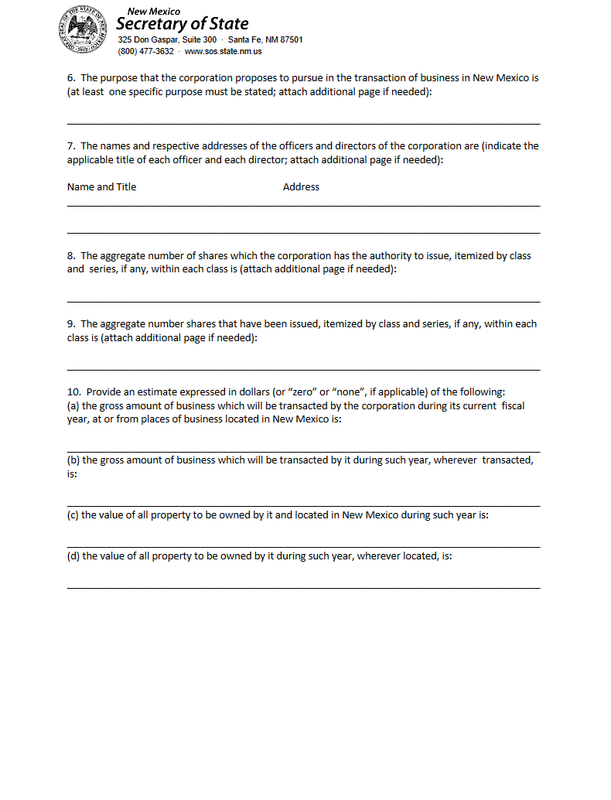 Step 10 - In Item 8, enter the Total Number of Authorized Shares this corporation has at its disposal. If there are different series and classes, you must report specifics on each one (Total Number of Each, Par Value, Comments such as Limitations or Privileges imposed or afforded). Step 11 - In Item 9, report the Total Number of Authorized Shares this corporation has already issued. This too must contain specifics regarding the series and classes if applicable. Step 12 - There will be several parts to Item 10. Make sure you fill this out accurately as it will determine the Filing Fee for this application. Any errors may cause a time consuming delay or cause a rejection of this application. In Item 10A report an estimate of the Gross Dollar Amount of business that shall be transacted by this corporation in or from New Mexico during the Current Fiscal Year. In Item 10B, report an estimate of the Gross Dollar Amount of business that shall be transacted, in the Current Fiscal Year, regardless of location. In Item 10C, provide the total value of property/assets that shall be owned by the foreign corporation in the State of New Mexico. In Item 10D, enter an estimation of the total value of property/assets that shall be owned by this corporation, during the Current Fiscal Year regardless of location. Step 13 - On the third page of the New Mexico Application for Certificate of Authority, an authorized Officer of the foreign corporation must sign his/her Name, provide the True Name of the foreign corporation, and enter the Date this application is being signed. Step 14 – Next you must calculate the Filing Fee for this application. This is to be calculate by totaling the amount in 10(A) and 10(c) then dividing it by the total of 10(B) and 10(C). Take the total of this, then multiply the Total Number of Authorized Shares (Item 8) then divide by 1,000 and multiply by $1.00. That is, [(Item 10(A) + Item 10(C) / Item 10(B) + Item 10(C)) * (1,000)] * $1.00. This total is the Filing Fee and must be sent as a check or money order payment made out to Secretary of State. Note: The minimum that must be paid regardless of the outcome of this calculation is $200.00 and the maximum is $1,000.00. 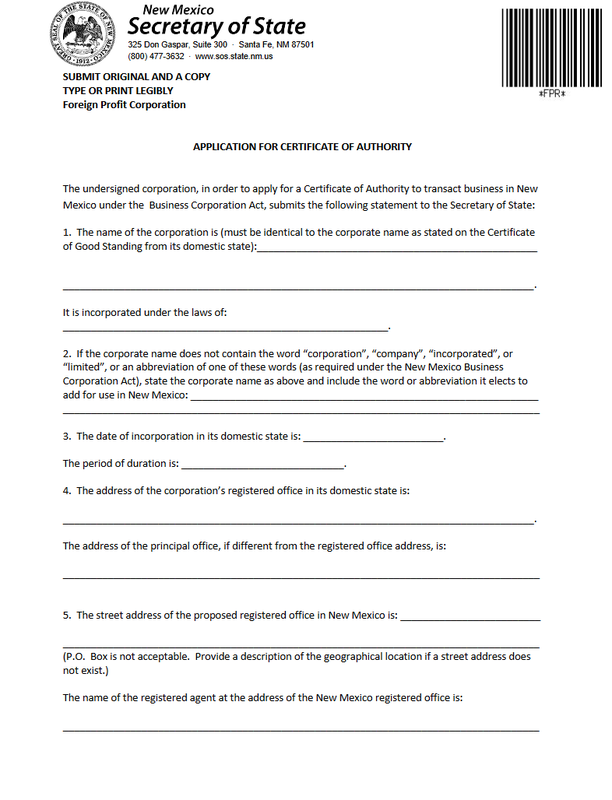 Step 15 – Make a copy of the completed New Mexico Application for Certificate of Authority for Foreign For Profit Corporation (both must be signed), a completed and signed New Mexico Statement of Acceptance By Designated Initial Registered Agent, A Certificate of Good Standing issued by the foreign entity’s governing body and dated within 30 days of the application date, a completed Document Delivery Instruction Form, all appropriate and required paperwork, and a check that represents Full Payment of all Fees (including Filing Fee) then mail to the New Mexico Corporation and Businesses Bureau in the Secretary of State. Note you will receive the copy you sent with your certificate however if you would like this copy certified then you must pay an additional $25.00 Certification Fee.